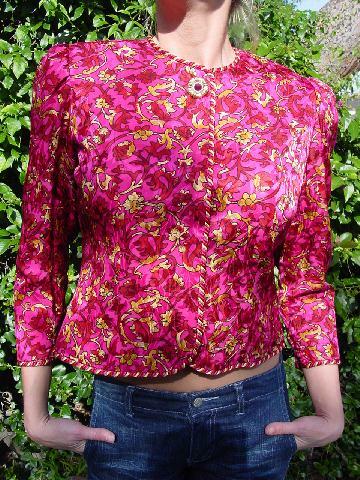 This 100% silk evening jacket is by Anne Crimmins and it was made in Hong Kong. It has a hot pink full lining and the exterior has a tone-on-tone pattern of flowers and leaves in hot pink, golden honey, yellow, black, and red. 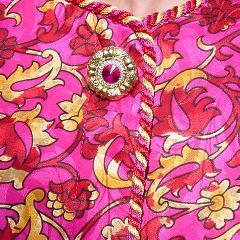 There are 4 hidden hot pink buttons down the front, a snap, and a large faux button with a center faux gemstone within a small silver-tone circle and a larger gold-tone freeform textured circle. It has long sleeves with 3 fabric covered buttons on each and there are shoulder pads with gathering at the shoulder-sleeve seams. 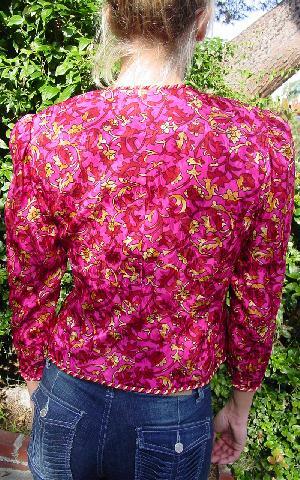 There is a jewel neckline and an accent cord that goes all the way around the edges and sleeve ends. It's from a stylist's inventory, and was worn in a film. bottom side to side 18"